[PDF] Strategy and Politics: An Introduction to Game Theory | Free eBooks Download - EBOOKEE! 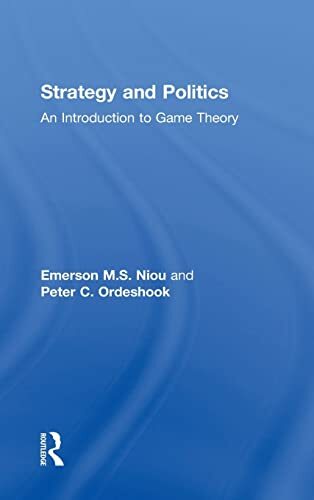 Description: Strategy and Politics: An Introduction to Game Theory is designed to introduce students with no background in formal theory to the application of game theory to modeling political processes. This accessible text covers the essential aspects of game theory while keeping the reader constantly in touch with why political science as a whole would benefit from considering this method. Examining the very phenomena that power political machinerieselections, legislative and committee processes, and international conflict, the book attempts to answer fundamental questions about their nature and function in a clear, accessible manner. Included at the end of each chapter is a set of exercises designed to allow students to practice the construction and analysis of political models. Although the text assumes only an elementary-level training in algebra, students who complete a course around this text will be equipped to read nearly all of the professional literature that makes use of game theoretic analysis. 2009-03-12Games and Information: An Introduction to Game Theory, 4th ed. No comments for "[PDF] Strategy and Politics: An Introduction to Game Theory".